1 of 3 Heat oven to 375 degrees. Coat a 2-quart baking dish with nonstick cooking spray. Place potatoes in a large pot and add enough cool water to cover by 1 inch. Bring to a boil and lightly season water with salt. 2 of 3 Boil potatoes 10 minutes, until fork-tender. Drain and push through a potato ricer (see Note) into a bowl. Alternately, transfer potatoes to a bowl and mash until desired consistency. Stir in milk, cream cheese, butter, parsley, salt and pepper until well combined. Spread into prepared dish and top with grated Parmesan. 3 of 3 Bake at 375 degrees for 25 minutes, until top begins to brown. If desired, increase oven temperature to broil and broil potatoes up to 3 minutes, until cheese is golden. 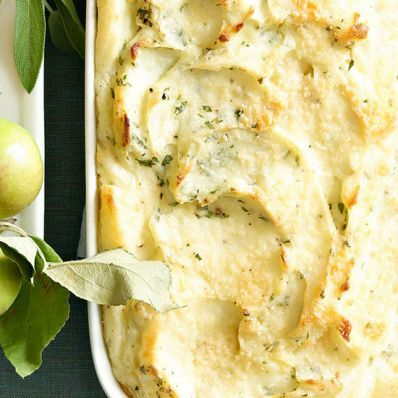 To make ahead: Prepare potatoes, top with Parmesan and refrigerate. Bring to room temperature before baking.